Margalefidinium (previously Cochlodium) polykrikoides. 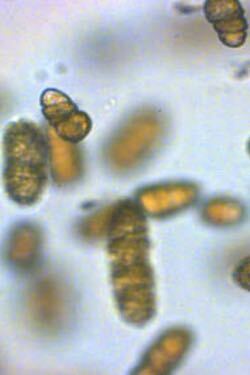 An athecate (i.e., “unarmored”), chain-forming dinoflagellate. Forms small chains of typically 2-8 cells. Found in coastal waters worldwide, including North America, Southeast Asia, South Korea, and Europe. M. polykrikoides has bloomed almost annually for at least the past several decades in the York River region of Chesapeake Bay and in more recent years also in the lower Bay's main stem and in the James, Elizabeth, and Lafayette rivers. In 2012 and 2013, very heavy blooms were observed throughout lower Chesapeake bay, from past the Rappahannock River to Tangier Island and along the Eastern Shore. M. polykrikoides is harmful to finfish and shellfish (ichthyotoxic). Human health effects are unknown. M. polykrikoides occurs in nutrient-rich coastal estuarine waters. In Chesapeake Bay it is found in moderate to high salinities (i.e. 17–28 parts per thousand) and typically blooms in lower Chesapeake Bay in July and August when temperatures reach 80-86° F (27.0°–30.0° C). VIMS researchers are studying the impact of Margalefidinium polykrikoides on aquatic life, particularly larval fish and oysters, through laboratory bioassays and sentinel field studies. Dose-response laboratory bioassays conducted at VIMS have demonstrated toxicity to brine shrimp, larval oysters, and larval finfish. Current efforts are also focused on determining the distribution of cysts (seeds) in Chesapeake Bay sediments.